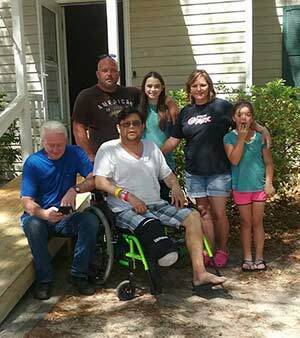 CRESTVIEW, Fla. (WLS) -- After spending days in the hospital, Jennifer Austin was just happy to be heading home after her husband Don underwent a partial leg amputation. But as they reached the front door, Don quickly realized he had not yet regained the strength or balance he needed to hop up their front steps with his crutches. Defeated, Don sat down on the front steps - and Jennifer wasn't strong enough to help him back up. They didn't know what to do next, but then a stranger driving by saw them struggling and circled back around. A man named Steve pulled up and asked if he could help, then lifted Don up and helped him into the house and onto the couch. Calling him an "angel," Jennifer was stunned by his random act of kindness. "I hope he realizes how much his thoughtful act is appreciated. He was a hero today, and we are so grateful that he was willing to stop and take the time to help people he has never met before," she wrote on Facebook. But Steve Smith's work wasn't done yet. As it turns out, he was a welder, too. 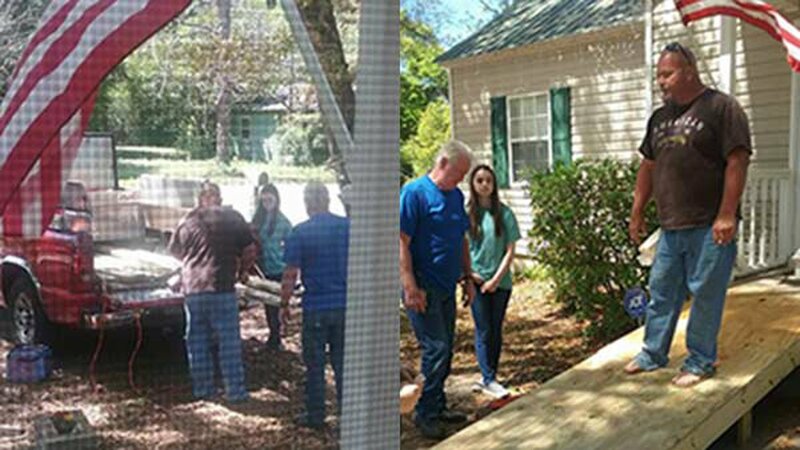 He returned to their house the next day - with some extra hands - and built a wheelchair ramp to the Austin's front door. "Brought Don, his mom, his nurse and myself to tears," Jennifer wrote on Facebook. "We just couldn't believe it. Wow. To be on the receiving end of such kindness is so humbling." Steve Smith stopped to help Don Austin get into his home after he was released from the hospital, then returned to build him a wheelchair ramp.